Note: This is part 7 of the Let’s Build Chuck Norris! series. Last time we managed to cross-compile and run C++ code for Android. It’s now time to write some Java code, but we need to take a detour on the desktop first. Gradle created a bunch of files, but for now we just care about the sources and the tests. Our goal is to write a test that demonstrates we can indeed get some ChuckNorris facts. 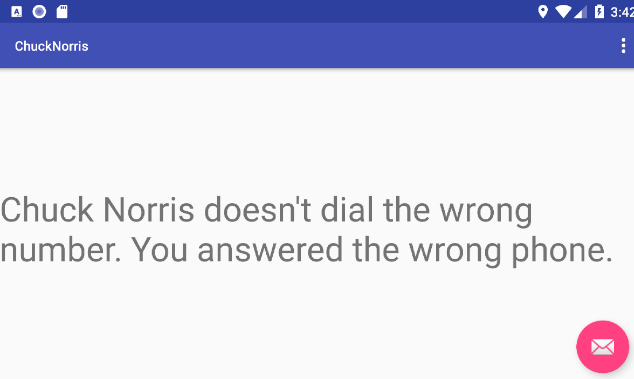 Expected: a string containing "Chuck Norris"
OK, this fails for the good reason. Now we can try and load our shared library using JNA. We create a CLibrary interface that implements the C functions we want to call as methods. (just chuck_norris_init for now). This is expected. We never told JNA where the libchucknorris.so file is. $ cmake -GNinja -DBUILD_SHARED_LIBS=ON ../..
How to compile the C++ code for Android. How to load some C++ in Java, but only for the desktop. It’s time to glue things together. To do so, the best thing is to use Android Studio to create the gradle project, starting with a with a basic activity so we don’t have to deal with all the Android boilerplate. We start by adding a text_view ID for the text view in the content_main layout. One of Java’s slogan is “Write Once, Run Everywhere” 2. And everything should work, right? To check if our code works, let’s create an emulator, and click on play. What? Chuck Norris can’t be stopped, this is unacceptable! Fortunately, there’s a more or less standard solution. If you put a .so file in a folder named src/main/jniLibs/<arch>, it will be included inside the Java application, and the Java code will be able to load it without any configuration. For simplicity purposes, we built the ChuckNorris library as a static library, just to show that the C++ binary still needed libc++_shared.so to run. But JNA needs a shared library to run. Remember in part 4 we had to call CMake with -DBUILD_SHARED_LIBS=ON to get a shared library. We’ll do the same thing, but going through Conan this time. Finally let’s create symlinks to all .so files from the package. $ ln -s ~/.conan/data/ChuckNorris/0.1/dmerej/test/<hash>/libchucknorris.so . $ ln -s ~/.conan/data/ChuckNorris/0.1/dmerej/test/<hash>/libc++_shared.so . That’s all for today. See you next time!